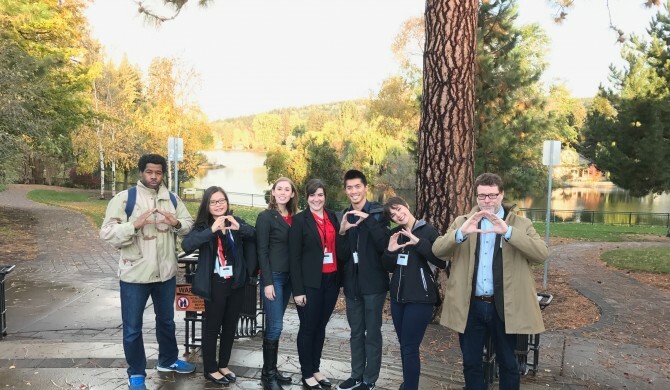 As we wrap up our Winter term at the Oregon MBA, I’m proud to reflect back on the efforts of our teams that took their ideas ‘on the road’ and across borders to socialize their ideas and gather valuable feedback from judges and peers. If no business plan survives first contact with customers, then you cannot overstate the value of getting out the building to share your idea with the world. Many will say that the ‘business plan’ is dead and that business plan competitions are a lost cause. We at the Lundquist College of Business respectfully disagree. Writing a business plan and putting together an investor pitch is not a waste of valuable MBA time. Rather, those activities are a forcing function for students to integrate the business model they’ve designed, the customer development they’ve done, and the core MBA functions of finance and strategy together in a well-communicated package. 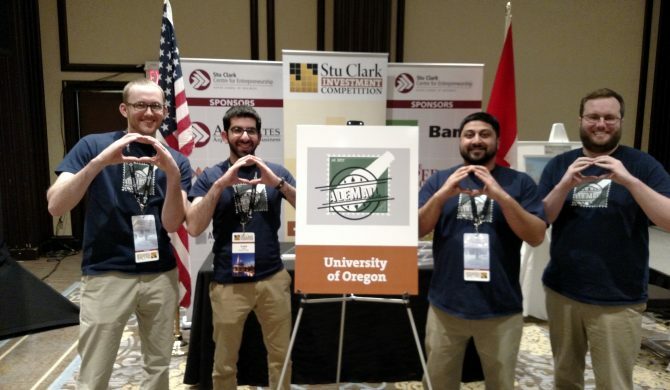 We send Oregon MBAs to these competitions to expand student perspectives and share in the joy of competition. When our teams compete, they get the type of hands-on learning that builds human capital for the future. No amount of classwork can prepare you for the challenges that come from unknown judges and competition from other well-developed ideas. Students learn from one another, sharing the experiences of the tough judges, travel, and experiences of a student entrepreneur. 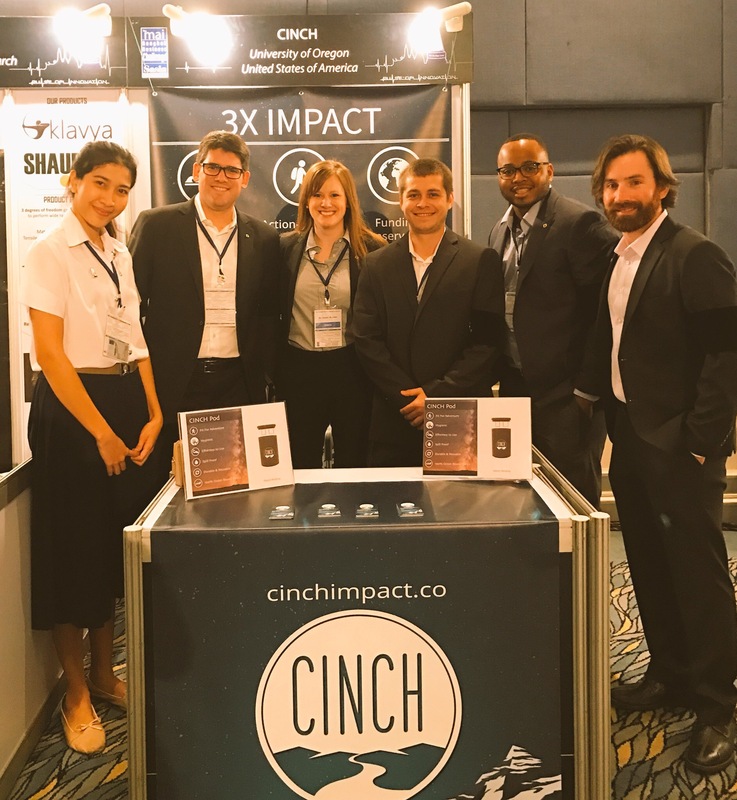 Whether it’s in Bangkok Thailand, Louisville, Winnipeg, or Portland, the outcome of these competitions is the same – experiences that shape ideas and outcomes for a students’ career. I run the programs and activities for the Lundquist Center for Entrepreneurship. My experience includes enterprise software development and implementations and operational process improvement. I started a biotech company called Floragenex, got it off the ground, secured investors and customers, and left it in the capable hands of a great team. 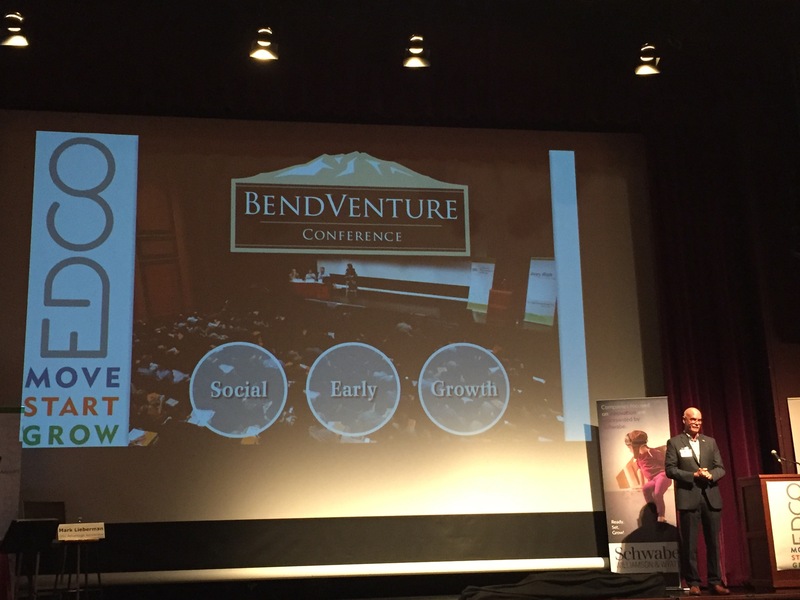 PART II: Interview with Dr. Michael Crooke, on sustainability, business, and the Oregon MBA. Conducted April 13, 2016 by Anna Raithel, Center for Sustainable Business Practices MBA, 2017. If we know that sustainability is important for companies and that sustainable choices often lead to profits, why do you think more companies aren’t choosing the sustainable approach? The first thing to say is that there aren’t any sustainable companies. There isn’t one company on the planet that is actually sustainable, that is, net neutral impact on the planet. We overuse that term. I would say, “We are on a path towards sustainability.” Companies that don’t subscribe to this way of thinking are becoming more rare. Many of the world’s largest organizations now subscribe to a GRI (Global Reporting Initiative). The first step is to measure where you are and what you are doing, and then set goals for how you want to improve. You’re not judged on how good or bad you are, you’re judged on if you are improving. Sustainability initiatives managers are smart – they can see that this is coming but they don’t know how to do it. One of my clients simply had to bring millennials into their strategic planning process, and now they have all kinds of new ideas around sustainability. 250 companies hold ¾ of the world’s GDP; the power is with the corporations. That’s where change has to happen. Is sustainability being driven by corporations’ deeper sense of responsibility? Or are firms responding to consumer demand? I think it’s both. It’s very difficult to argue that global warming isn’t real. It’s a powerful rising of the tide and it’s happening in real time, so companies know they need to get in front of that. If they’re on the backside of that and their competitors launch a similar product that’s more sustainably made, they’re not only going to have lower costs down the road, but the customers are going to follow those companies. I had the opportunity to speak with Steve Jobs in 2008 and spent about an hour with him in his office. He thought that within 15 years the environmental aspect of his product was going to be as important as the form and function of his product. He was such a visionary, he could see beyond the horizon, and he was already building that into the company. Consumers are demanding it. They want to see it in everything they do, what they wear, what they eat, the kind of house they live in, etc., just like any trend. When we started using organic cotton at Patagonia our jeans were $85. Now you can basically buy the same pair of organic jeans at Wal-Mart for $13. Whole Foods started supplying organic food to the masses and now Costco is the #1 organic food supplier in the world. It’s happening at different rates in different places, but overall from a regression line point of view I think it’s a rising tide and everyone will be able to benefit. What is the role of government and policy in driving sustainability? Think of the greatest environmental presidents of our time. Why is Nixon one of them? That’s when the Clean Water Act was passed, and the Endangered Species Act – all of these major policies happened under Nixon, a Republican. I think the leadership has to come from government. Think about what those laws have done and how the basis for environmentalism was created in the 1970’s. Go back to the beginning and think about the food movement and Rachel Carson and Silent Spring (1962), and the power a book like that can have. I think it’s certainly synergistic, but the bottom line is that you need a progressive government. You need a government that understands and protects the people in our capitalistic society. There are a lot of people that believe in the Adam Smith model that a manager’s duty is to make money for shareholders. [There is] no mention of shared value or of societal value. That’s where you start to see b-corporations and nonprofits. Government is very important and it has to work hand in hand with the pioneers; the Yvon Chouinards, the Rachel Carsons, the Anita Roddicks of the world. Do you think there could be a point where sustainability will no longer offer a competitive advantage because it’s such common practice? I don’t see that, certainly not in my lifetime. If you take the absolute ideal of what sustainability could be, Michael Braungart’s Cradle To Cradle (2002), you get done with your shirt, throw it into your garden, it composts, the organic and inorganic compounds go back into the soil, and there was no net loss of nutrients in that product. We’re a long ways off from that. But that’s the brilliance of Cradle To Cradle, to lay that concept out and really look at what that panacea could be. Or like the rocket fuel that was proposed at the New Venture Championships in Portland. The fuel was 50-60% more environmentally friendly, it worked better, and rockets could go farther. Sustainability was at the heart of that whole technology and they won the competition. We might be forced into that sort of thinking. We might not have a choice. Mars might not be ready yet. 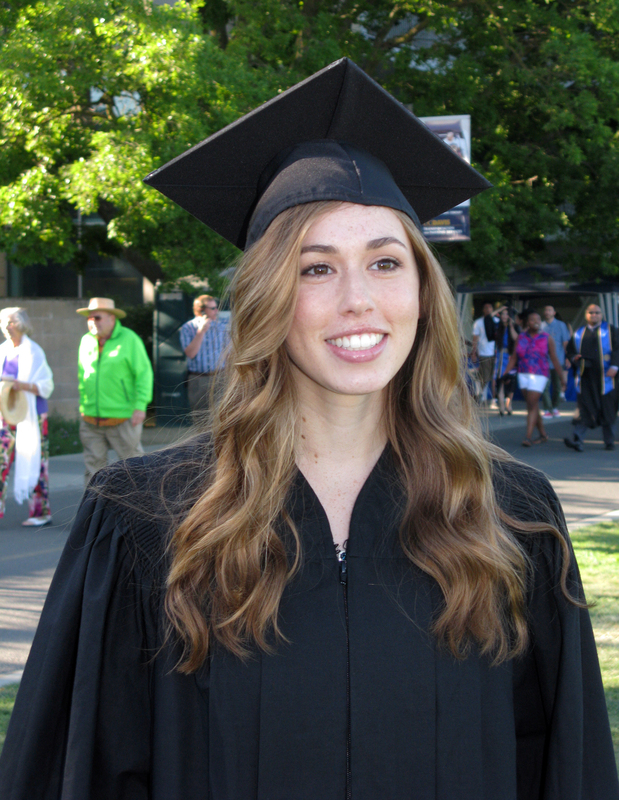 Anna is pursuing an MBA with a focus in Sustainable Business Practices, graduating 2017. 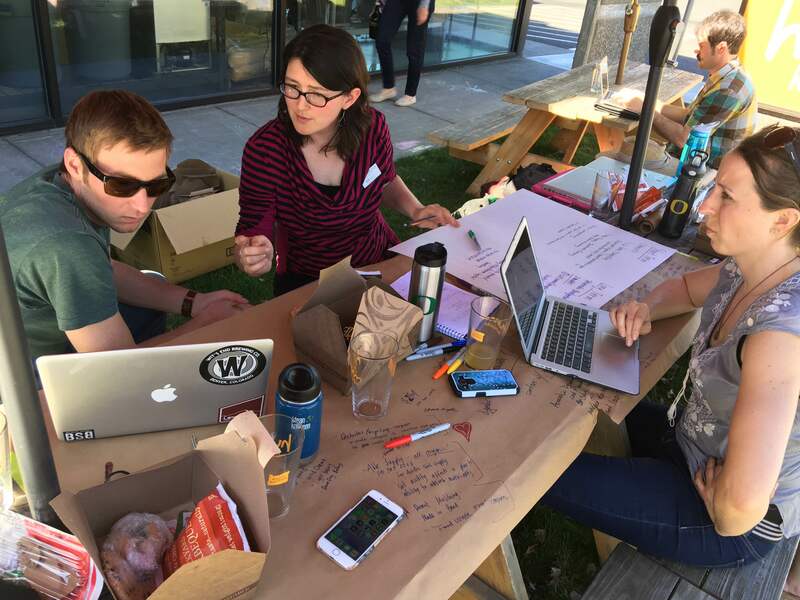 Four minutes before 10 o’clock, on a gorgeous sunny day in Bend, Oregon, the UO Net Impact Graduate chapter piled out of Suburus and Priuses onto Humm Kombucha’s lawn to kick off our chapter’s inaugural Impact Trek. Our plan was to use our diverse backgrounds, passion for sustainability, and graduate student can-do-it-ness to offer free sustainability consulting brain power to businesses in exchange for the opportunity to get to know their company and present our ideas to them at the end of the day. The trip was organized by our president, Katie Clark (who is famous at Humm for dressing as a bottle of their Blueberry Mint Kombucha this past Halloween) and fellow second year Andrea Teslia. The trip was modeled after the UC-Berkeley Net Impact chapter’s Impact Trek to Patagonia in Ventura, CA. After shaking ourselves out from the two hour drive from Eugene, we were met by Mike and Jeff—our fabulous tour guides, sounding boards, and supervisors for the day. We started our behind the scenes tour at—where else? !—the Humm taproom where we each tried every flavor they had on tap! 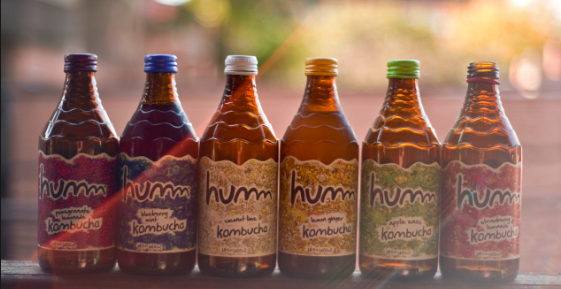 Humm’s taproom has the distinction of having been the first kombucha tasting room in the contiguous US. One of the first and lasting impressions we got from the factory floor was that everyone was smiling! 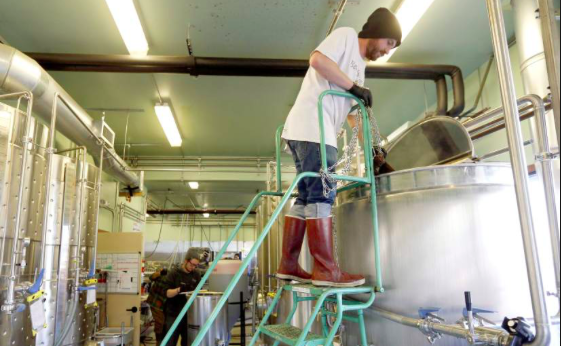 People were genuinely having a good time and all along brewing and bottling lines, employees waved, smiled, and offered us bottles of lemon ginger kombucha right off the line. Everywhere we went at Humm, there was a feeling of operating from abundance. 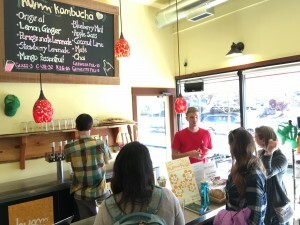 Everyone we met was generous with their time, generous in their attitudes, and generous with their pours of kombucha. This feeling of authentic good vibes was very evident in the “fermentation room.” Kombucha is a fermented drink made by introducing SCOBY (symbiotic culture of bacteria and yeast) into tea and allowing it to ferment into the effervescent drink many of you are probably familiar with. Referencing the work of Masaru Emoto—the scientist who discovered that water exposed to pleasant thoughts and words created beautiful crystals when frozen—Mike explained to us that the lavender walls, loving names like “Ulysses” written on the SCOBY drums, and the hand drawn hearts placed here and there were all in an effort to infuse their tea with love. The tour was all fun and games and kombucha, but, after an hour, we retired to some picnic tables on the front lawn to get to work. Our task was to offer solutions for the SCOBY and tea waste products that Humm ended up with each week. Our team brainstormed together and then broke out individually to google, reference class materials, call professors, text ex-colleagues, and follow as many rabbit holes as we could. After 4 hours of work, we compiled our best ideas to share with Jeff. In the short term, we shared resources for offsite composting in farm supply markets and onsite composting options. In the long term, we gave Humm preliminary specs for purchasing and operating an anaerobic digester, either as a community project or on their own. We also talked about the leadership role that Humm could potentially take in the realm of zero waste and composting. After a great day of working together, we also made sure Jeff knew that the next time Humm is looking for help with efficiency or sustainability projects, the Center for Sustainable Business Practices would be a great resource for eager, educated, free labor who will happily work for bottomless kombucha! Net Impact spent the rest of the weekend in Bend working with Mt. Bachelor Ski Area (whew, this sustainability consulting is sooo rough…!) and visiting Deschutes Brewing (salmon safe hops were an educational highlight of the tour!). On Monday, we all showed up to class tired, but elated from a fun, productive adventure weekend, and craving a tall glass of cold Kombucha. Kate is a 2017 MBA/MPA from the Center for Sustainable Business Practices. Originally from Wisconsin, Kate graduated with honors from the University of Wisconsin with a political science degree and spent time working in state and national politics before pivoting to nonprofit resource and program development. 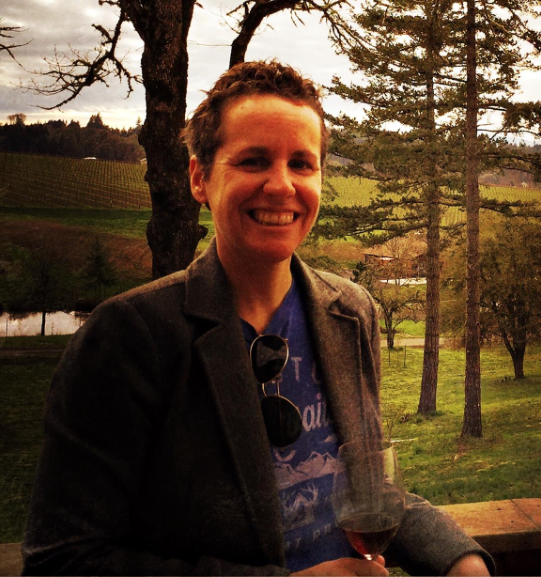 Kate is an active member of LiveMove and Net Impact and is happiest when working at the intersection of policy, planning, and business development through social and sustainable enterprise. After graduation, she plans to work where she can use finance and sustainability strategy to impact the triple bottom line. 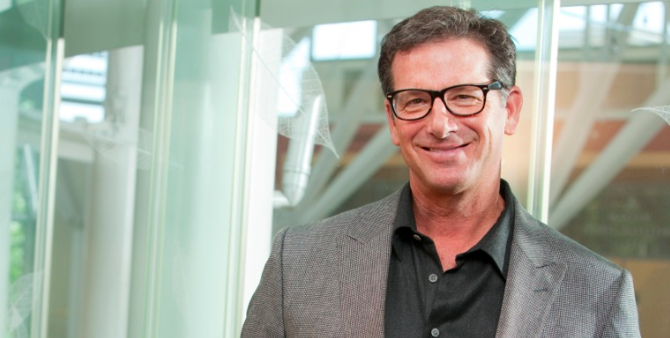 PART I: Interview with Dr. Michael Crooke, on sustainability, business, and the Oregon MBA. Conducted April 13, 2016 by Anna Raithel, Center for Sustainable Business Practices MBA, 2017. Sustainability is our ability to deliver the planet in its current state indefinitely into the future. We’re on a path to sustainability but we’re still moving backwards at an alarming rate. Sustainability to me is ultimately the Cradle To Cradle (Michael Braungart and William McDonough, 2002) type of a definition; that we’re consuming only what is grown. It’s like a sustainable forest – the board feet coming off are equal to the board feet being grown, and you can use it in perpetuity. I want people to think about how business has the power to turn things around. If business doesn’t get on board and start developing value chains that win in the competitive arena, then all is lost because that is where the power is. That is why it is so exciting to be talking about sustainability at a business school. Magnificent, off the chart changes happen when Wal-Mart changes packaging for two or three items, in regard to waste and CO2. Or the way Nike changes the way they knit a shoe, or the materials used like waterless dyes. The technology and these products are sustainably superior to what they replaced. That is what will turn things around. How is sustainability integrated into business? What kind of value does it add? At the University of Oregon we talk about sustainability as being embedded in the value chain of an organization. It’s not something you do “outside”, that after you do good you do well – it’s actually embedded. We feel that the differentiated companies of the 21st century, the ones that have a long term competitive advantage, they will have a rising tide of sustainability embedded in their value chain as part of their value proposition to the customer. Customers of today are becoming more and more sophisticated in terms of which brands they support and are loyal to. Every time the customer touches the brand it has to say the same things. Once you get that trust of the consumer you have a more valuable brand. The customers are willing to pay more and that creates a higher margin. It’s an interesting way to think about sustainability – that you do it because you want to have a competitive advantage, but you also believe in it, it’s part of your values. 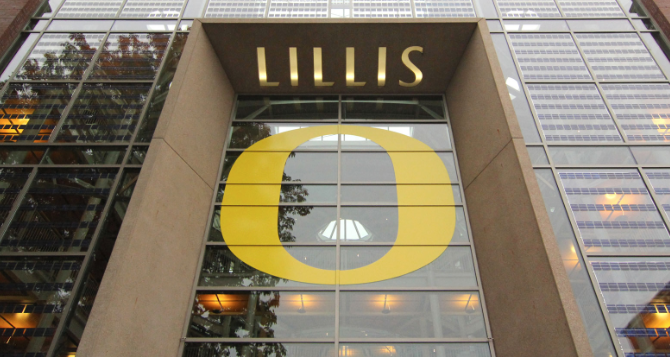 What makes the Oregon MBA so special? We are using business to inspire and implement solutions to the environmental crisis. The people who come through our program are going out there and changing the world. They’re doing it one small step at a time but with impact. These are smart, hungry, and aggressive individuals. They’re on a career track, working in situations in which they are highly engaged. They want to be a part of the solution, and business is a big part of that solution. This is a very hands-on, experiential program. When our students step out the doors of University of Oregon they’re ready to go – engaged and contributing from day one. I came here as a professor for the same reasons. After my business career I was teaching at Pepperdine University and I kept getting pulled back to University of Oregon, and now I can’t imagine being anywhere else. So it happens to the professors too. What do you hope is your students’ main takeaway from their time with you? I hope they understand that I’ve made so many mistakes, and when they make mistakes they have to move forward based on their training and their gut. They have to move with their values and at the same time realize that if they don’t take any risks they’re not going to make any mistakes. 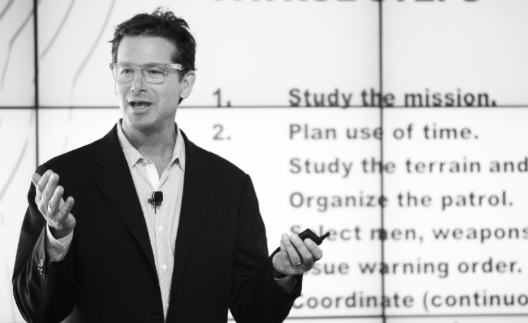 You can pivot, and you don’t have to get that perfect job right out the gate. It’s going to be a curvy road and if you go with your heart, you have strong ethics and values, you can’t really go wrong. You try to align yourself with like-minded people, with mentors, with people that want to get you up the learning curve quickly. You just don’t know what you’re going to encounter on the journey. 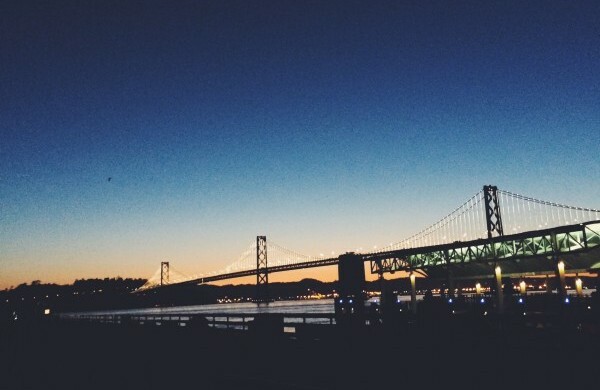 At the end of March, the Oregon MBA offers our spring experiential learning business tour to San Francisco. During the week-long visit students are able to network with companies around the bay area and gain perspective on their industry from a diverse set of professionals. 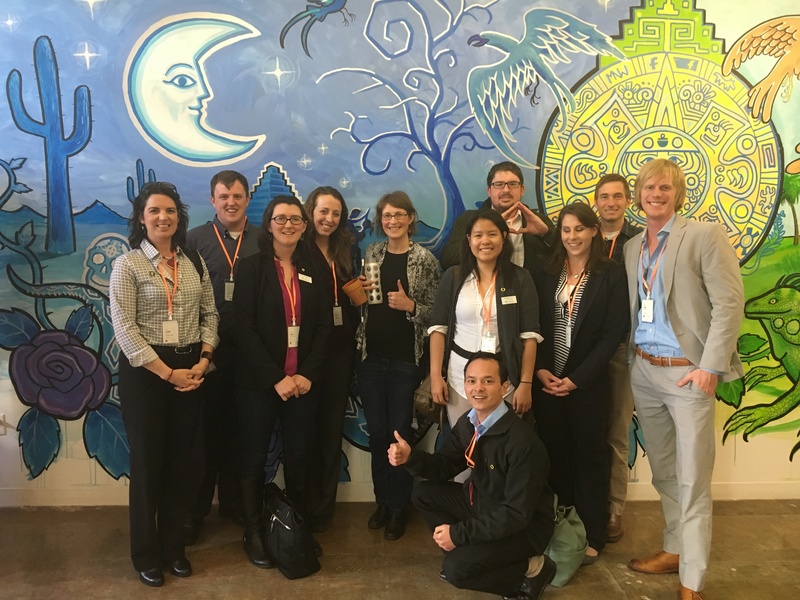 In this post three Center for Sustainable Business Practices students provide a brief glimpse into a few of their favorite visits. Big thanks to the contributing authors. While on our experiential learning trip to San Francisco the we had the opportunity to meet with Erik Distler, Senior Resource Specialist with the Green Sport Alliance. We gathered with Erik on a sunny day in Yerba Buena Gardens. He was keen to explore our unique backgrounds and interests related to sustainability, as well as share both his professional background and the personal journey that took him from Pricewaterhouse Coopers (PwC0 to the nonprofit world. Erik described how his time in sustainable consulting at PwC gave him the tools to communicate the business arguments for sustainable business practices. His ability to not only present a business case for sustainable practices, but also help PwC’s clients communicate their stories around sustainability, enabled Erik to become an invaluable asset. This storytelling ability is what opened his opportunity with the Green Sports Alliance where he now brings sustainability to the sporting world and beyond through partnerships with ESPN. Erik related how he has seen demand grow and discussed future opportunities as the field continues to develop. After listening to our stories, Erik described how stories from his journey with sustainable business could help us understand the landscape from a professional view. He provided unique prospective and insight to help us understand how to leverage our experience in the Center for Sustainable Business Practices to find our place in this changing climate of sustainable business. Meeting with Erik allowed us time for introspection about the opportunities in front of us and provided inspiration about what the future may hold. On Wednesday morning, March 30th, we braved the impossibly traffic-free 101 to visit with the Sustainability team at Facebook HQ. Our host was Lyrica McTiernan, Sustainability Manager, who was joined by Louisa Smythe McGuirk, Sustainability Analyst. 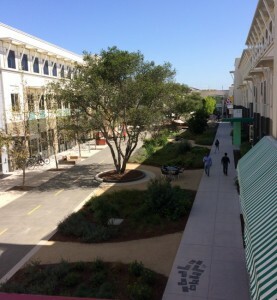 Lyrica has been at Facebook for over 5 years, and has witnessed what she described as a “journey of maturity of understanding of sustainability at Facebook”. Louisa is primarily focused on metrics, measuring how FB is progressing on its sustainability goals. Her first project involved calculating Facebook’s carbon footprint, the 5th time such an assessment had been completed. The primary goal in doing the carbon footprint is identifying the most actionable items for the largest impact. Facebook currently does not do specific reporting like GRI, and the general consensus is the time and energy required is not worthwhile. The scope of carbon reporting is expanding as Facebook moves into consumer technology with their acquisition of Oculus. On Thursday March 31st, the Oregon MBA had the good fortune to meet with the Sustainable Accounting Standards Board (SASB). SASB seeks to be the sustainable complement to the 10-K annual report by creating the standards by which public entities can measure and report their Environmental, Social, and Governance (ESG) efforts. Put another way, where FASB standardizes how companies report their financial accounting, SASB standardizes how companies identify and report their sustainability track record. These standards provide information that is decision-useful and complementary to financial accounting information. Put another way, SASB is making an awesome contribution to the stewardship of people, planet, and financial returns. The CSBP came to SASB at an amazing time. The day before our visit, SASB had released the last of eleven sets of provisional standards to the public, marking the end of a four-year process of creating and tinkering. SASB was proud to show off their Materiality Map which reporters could use to identify what to report. This Materiality Map is important for streamlining standards into the market. These standards are coming to a receptive marketplace, as there is a clear trend towards more comprehensive reporting of ESG from the public and private sectors. In Europe, the EU is mandating that their member states report on ESG metrics. Meanwhile, in the United States, investors clamor for greater transparency and accuracy of corporate sustainability reporting. There are certainly hurdles ahead of SASB, however, the information that standards are trying to capture is crucial for markets to gain greater long-term efficiency. Indeed, many stakeholders across the value chain are coming to realize the importance of a company’s relationship with the environment and employees. The release of the provisional standards also represents an area of opportunity for MBA students through SASB certification in the Fundamentals of Sustainability Accounting (FSA). Achieving FSA Certification would be beneficial training for students that are considering careers in sustainability. Furthermore, holding certification creates a critical edge of expertise in a market clamoring to understand the role of ESG in investing. 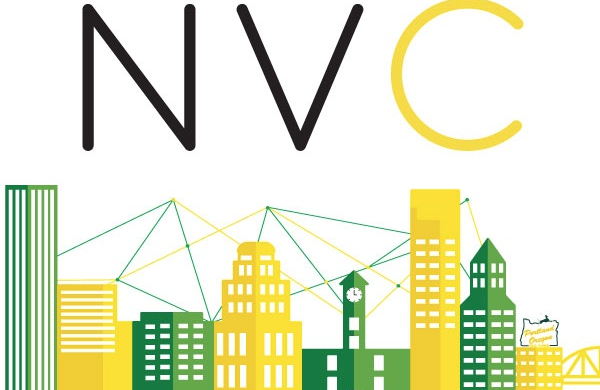 This past weekend I had the honor of being a moderator at the New Venture Championship (NVC) in Portland which is an international entrepreneurial investment competition presented annually by the University of Oregon’s Lundquist College of Business. The 16 selected student teams from around the world pitched their business plans to a panel of judges, gained valuable feedback, and had the chance to win over $60,000 in cash prizes. The first session teams practiced their 60 second elevator pitches and received feedback from the judges. The second portion consisted of 30 minute presentations during which a judge could interrupt at any time. 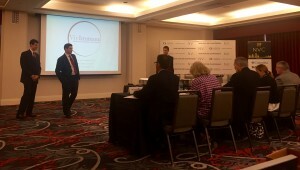 Judges challenged teams to defend their plans and their ability to move a pitch along, simulating a meeting at a busy VC firm. The first day was not scored, however, timing was critical because it was my job as moderator to stop them at exactly 30 minutes – no exceptions. Teams were meant to take the judges’ feedback from Day 1 to prepare for Day 2. 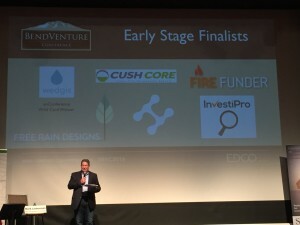 That evening, the teams competed in a tradeshow and elevator pitch competition. 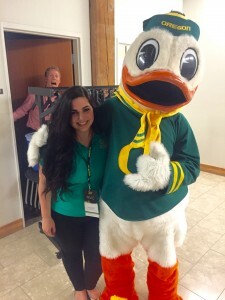 Not only was this a great opportunity to network with students, judges, and guests, but it was a chance to learn how to effectively talk about a business idea (and to get an unexpected photo-op with the Duck). The second day we welcomed a new set of judges for the semi-finals which consisted of the same format as the previous day, but this time the judges scored the presentations and selected teams to advance to the final round. After the pitches, all teams, judges, and moderators met in the ballroom to enjoy an amazing lunch and keynote panel of successful female entrepreneurs. The panel was a chance to hear real business women discuss the grueling process of heading up a start-up, how they continuously pivoted, and what they have learned. As a previous NVC competitor, UO alum and Red Duck co-founder, Shannon Oliver gave input on the competition, stating “you can’t do well in this competition if you don’t know what you’re talking about, and in order to know what you’re talking about you have to have done your research”. This was spot on. The most successful teams were the ones that could authentically talk about their business and motives behind their venture, and convince the judges that they were knowledgeable about the industry. After the lunch and judging deliberations, all participants, judges, and organizers took time to relax and mingle at the Portland Bowling Mixer where students showed off their bowling and gaming skills! VivImmune from the University of Arkansas presenting to the judges during the finals round. The final day of the competition was an amazing learning experience. All moderators took on the roles of “shadow judges”. We watched the final presentations, critiqued each pitch as a group, and gave final recommendations to the judges. After providing feedback, we got to sit in on judges’ deliberations, and were proud when our rankings matched. As someone who wants to work with start-ups and may participate in this competition next year, the opportunity to hear the judges’ questions for the teams and rationale behind final decisions was an irreplaceable educational experience. 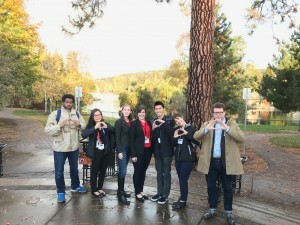 The winners were announced at the Awards Reception where we got to end the weekend on a high-note – the TougHer team from the UO won second place and took home $10,000! Congrats! Be passionate.It’s not enough just to have a polished presentation. The most successful and convincing teams were the ones that were the most authentic and presented from the heart. Get your financials in order.When a judge doubts one number, they begin to doubt them all. Then they begin to question your credibility. Not sure about your numbers? Go the conservative route, but be able to explain your reasoning. Be prepared to be interrupted. A real pitch is a dynamic conversation. Come ready to answer any question about your business plan and anticipate judges’ concerns. Including answers to these concerns in your appendix will also help you maintain your cool during the Q&A. Network.This competition is rich with knowledgeable students, judges, and business people – use this opportunity to your advantage. And don’t forget to have fun! Be there to learn.We get it – this idea is your baby. However, if you’re open to critique and look for the learning opportunity in every situation, you are more likely to pivot in a direction that will lead to success. Kathryn is originally from the Bay Area and is currently a first year MBA student in the Lundquist Center for Entrepreneurship. As many of you may have already heard, our very own TougHER (Stacey Edwards, Brawnson Adams, and Justin LaTempa) took second place at our New Venture Championship this past weekend. In addition to the $10k prize, I know the team gathered great feedback and ideas from the judges and found inspiration in the response to their opportunity. Kate Blazar, leader of team Animosa helped us make the event great for our guests in her role as LCE GTF, helping all weekend and spearheading our annual team social/bowling event. Both TougHER and Animosa are continuing forward towards making their dreams real through our Venture Startup class and other Oregon MBA courses. 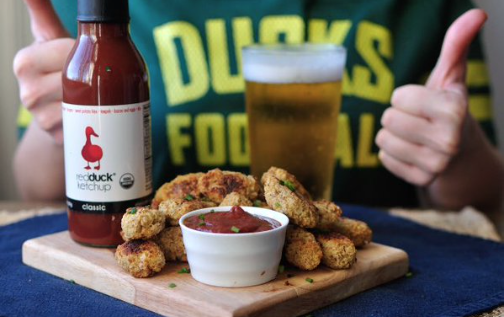 Red Duck Foods has launched a line of BBQ sauces and is expanding in the Northeast US soon. They are adding stores, raising money, and having fun. 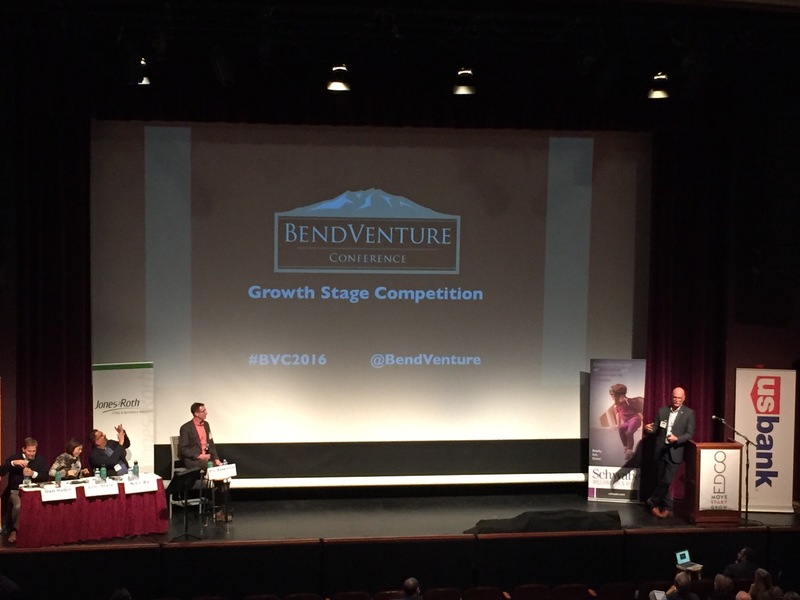 Co-founder Shannon Oliver was on our panel at NVC and it was amazing to see how mature and wise the team has gotten as they’ve built a great company. Cowbucker continues to share the ‘Bucker’ with more of the world! That team is adding schools for licensed products and launching new designs to keep their business growing. Stop by 222 E 11th and visit their local storefront to see what’s new. AirFit is now Roam Fitness – With a prototype gym in Bend, and the first location at JFK moving forward, Ty and Cynthia are making great progress towards making us all happier and healthier travelers. 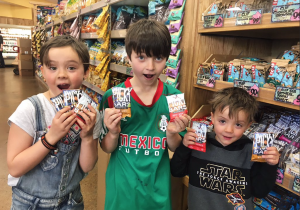 And in other news… Oregon MBA Alum extraordinaire Jesse Thomas has recently made a big announcement about his company Picky Bars. 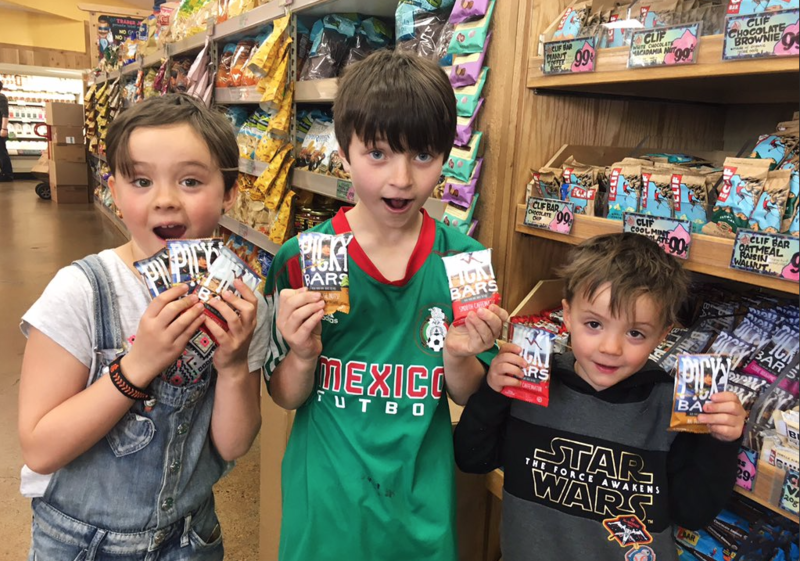 Spoiler: Look for them in your local Trader Joe’s!!! So what’s the theme here? I’d say that the Oregon MBA attracts and encourages independent thinkers with the passion and commitment to make their dreams reality. Our programs and classes, in all subjects, push students to think bigger and be disciplined in applying what they’ve learned in class. Our community of alumni, mentors, and others provides the foundation for testing business models, building connections to industries, and growing a supportive network that helps in unexpected ways. It’s an honor to watch ideas become reality. 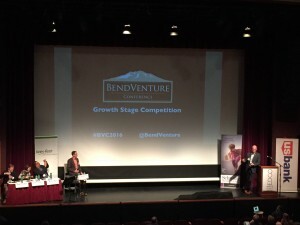 The same set of immense challenges face all entrepreneurs. The knowledge, skills, and learning environment that we provide here helps our students gain an advantage and go forth to build great companies. We should all be proud of our startup Ducks! The Lundquist Center for Entrepreneurship has fostered some impressive start-up companies over the years. 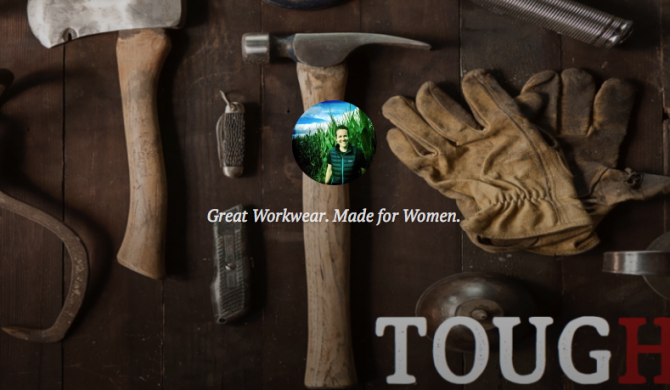 One of the current MBA start-ups is TOUGHER a woman’s workwear company. The company’s new blog describes the evolution of the concept. Check it out below or on the Wear TOUGHER blog. During today’s 3-mile run fraught with rain, Beyonce’s anthem of female empowerment fueled an extra “umph” in my stride despite what felt like nature spitting in my eye. As the talented singer rhetorically asks, “Who runs the world? (Girls),” I thought of the nearly 400 women we have interviewed who Grow, Build, and Make. Women who similarly motivate me to work harder and leave me inspired after every conversation we have shared. TOUGHER women run the world along with some incredible men, who are their colleagues, partners, friends, and supporters. The major difference between the two sexes, however, is that a serious oversight has long existed for women who need and want durable clothing that fits their body’s frame and protects them while they repair fences, birth calves, or grow stunning crops and flowers. Men have had their pick of workwear brands; whereas, nearly all women we have interviewed are left to shop the men’s aisles (98%) and must modify their clothing to make them work in clunky fashion (89%). Imagine having to hack your clothes with scissors and duct tape just to make them work for your job or passion. 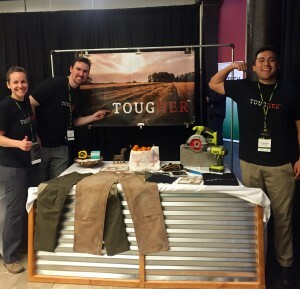 TOUGHER‘s mission is simple: Great workwear. Built for women. Yet, emails received from women nationwide remind us that what we represent is more than that. TOUGHER acknowledges and celebrates the importance women in skilled trades and artisanal crafts represent. What our customers create matters and deserves our attention. Imagine a time before sports uniforms were made specifically for women and girls. A not-too-distant past where sports bras did not exist, but had to be made by 3 women sewing together two jockstraps because no such thing existed in 1977. Once apparel was produced to outfit women and girls for sports, it signaled to the world and its wearers that what they contributed to sports mattered- regardless of whether they were a professional athlete or not. In similar fashion, designing and selling durable, comfortable apparel for women is our way of raising a glass to all women who grind it out each day and work hard with their hands. Your apparel is in the design phase and coming. We can’t wait to see what you do in it! Here’s a toast raised to you. 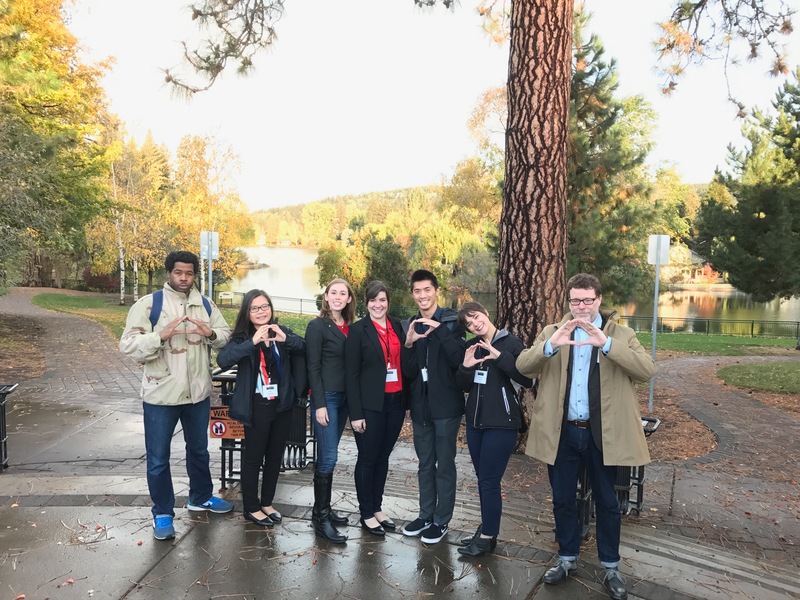 The UO Lundquist College of Business empowers an engaged community of students, faculty, staff, and stakeholders who create, apply, and disseminate knowledge that contributes significantly to their professions, communities, and society. The college delivers a dynamic learning environment where world-class professors engage and get to know students, where students work on real projects for real companies, and where alumni go on to high-powered jobs worldwide.